But I should not be, because they have added zombies to Minesweeper. That turns out to have been a terrific idea. The result of this mad combination is called Zombie Minesweeper: A Love Story. In this iOS game you are a girl who must get from here in a suburban town to there, one Minesweeper-style level at a time (if, say, a back yard or a sidewalk was a Minesweeper board). It's simple, but for the problems of the mines and the zombies. The path from here to there is pimpled with landmines. The mines are hidden beneath fog, but walking near one reveals that some patches of ground in this suburban nightmare are painted with numbers: a 1 if one adjacent square contains a mine, a 2 if two do, and so on. Planting a flag on a suspected landmine site renders that square harmless to your character, should she tread over it. In real life the person who dawdles while playing Minesweeper must worry that their boss will catch them. 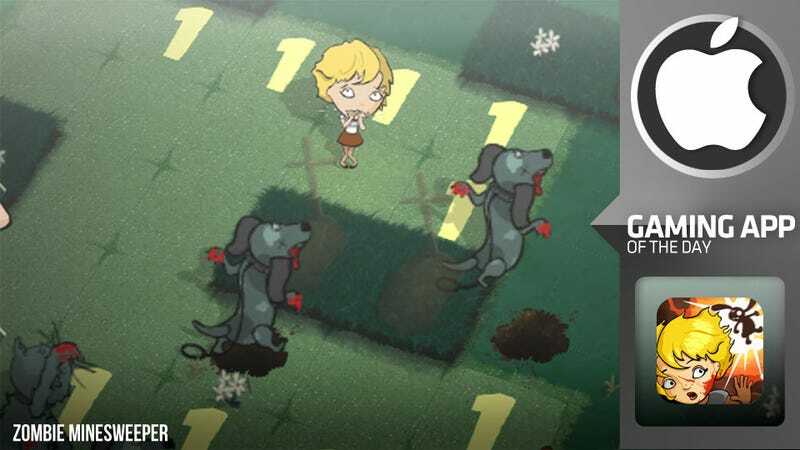 In Zombie Minesweeper, the dawdling player must worry that the game's suburban zombies will. As you poke for mines, zombies will sprout from the ground and close in for a kill. The skilled player will be brisk, guiding zombies into squares that contain mines without being so reckless as to run themselves into new, undiscovered mines. At the end of each level is a plunger. Pressing it detonates all the mines throughout the level, popping all of the wandering zombies near them like the explosions of a string of firecrackers. The concept of Zombie Minesweeper may have emerged from a prankish or cynical mind. Fleshed out, it proves that the simple, ubiquitous Minesweeper greatly benefits from an infusion of the undead.